I had posted on my blog earlier in the weeks that I was taking part in a make up swap with someone from the US , Chicago to be precise. I did the swap with Claire, who is a beauty blogger from Chicago. I thought this was a good way to try out different products that aren't available in the UK. I really enjoyed going out and shopping for the swap, to me any excuse to do a bit of make up shopping is always a good thing! 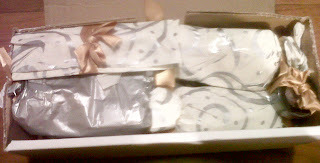 I received my parcel last Thursday, and I have to say I was over the moon with everything I received. I was literally like a kid at Christmas when I got this parcel and when I was opening everything!! Unfortunately through travelling he two Wet and Wild palettes shattered a bit, but I am still thrilled with them! It is bound to happen whilst travelling such a distance, and it was wrapped up very well. I am so happy with all the items I received! I was so excited to try everything, and I have to say everything I've tried so far I've loved! I have really enjoyed doing a make up swap and think its a great way to try new products and to interact with other bloggers! I am very grateful to Claire for being so good throughout this swap and she did such a great job at picking products and colours that I love!! If you would like a review on any of the products from this please leave a comment and let me know!